One of the most under appreciated techniques in auditioning, especially true in taped auditions, is the skill to be still. It’s probably the hardest time to be still, when you’re playing a scene that you haven’t had much chance to rehearse and analyze. The excitement/fear of auditioning can create “energy leaks” in us in ways that we aren’t aware of. Swaying back and forth on our feet, head gestures that can resemble one of those bobblehead dolls, hands and arms flailing around, etc. These are due to your relative unfamiliarity with the script, your self-consciousness of not being as prepared as you'd like to be, and the high stakes of having one chance to be hired for this job. It's easy to see why you can have energy leaking out all over the place. Once you've been hired, and have had some time with the script, chances are lower that you’ll still be doing that stuff, since what creates those movements is tied to the excitement/fear of auditioning new, unfamiliar material, and that usually burns off after some rehearsal. But it can be an unconsciously learned muscle memory at that point! 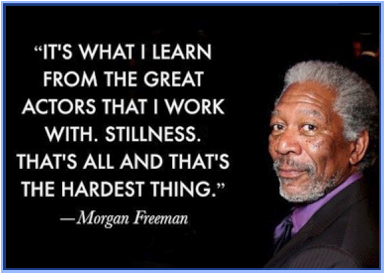 So, as Morgan says, learning to be still is a skill you must acquire. For all acting situations. And especially anytime you’re being shot on a close up. As in: Every time you are being taped in an audition. An image I've suggested for actors that works for a lot of them is "be the blue part of the flame". While all that drama is going on with the flickering yellow parts, the core, the blue part, is so strong and so compelling. That should be you. What's even worse in the audition taping scenario, the closeup shot exaggerates any movement, whether just raising your eyebrows (almost never a good thing to do) or shifting your weight from one foot to the other. I have to prove this to actors all the time, by showing them on the playback that they’re moving a lot more than they think they are when they come to me for a self tape session. "Wow, I was doing that?" Extraneous movement, and even many gestures that look fine in a stage presentation, simply dilute you in a closeup shot. You are, almost always, more interesting when you are still. Take it from Dr. Freeman.